Tonight – late evening on November 11, 2019, until the wee morning hours on November 12 – the North Taurid meteor shower is expected to peak. 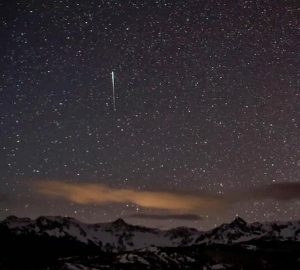 Unlike some meteor showers, the North Taurids don’t exhibit a sharp peak, so the meteor rates may remain fairly steady throughout the weekend. Unfortunately, the Taurids are peaking under the glaring light of a full moon. 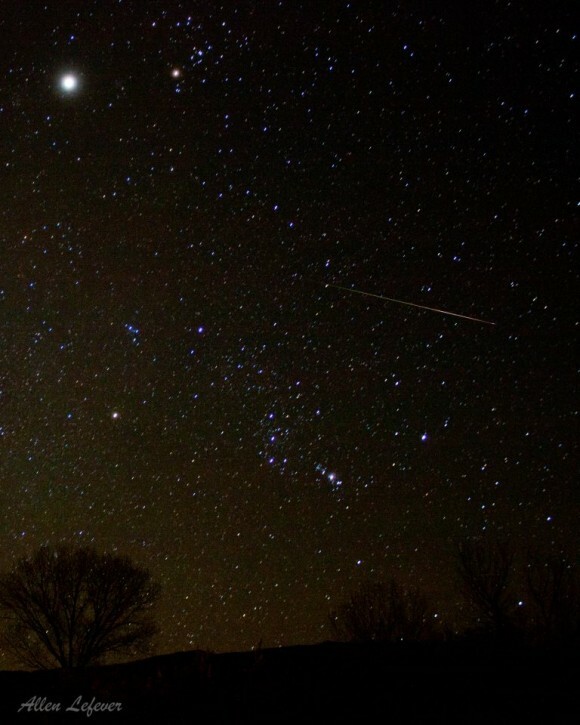 In a dark sky, you might have seen 5 to 10 meteors per hour. In a moonlit sky … we can’t estimate precisely, but you might see a few meteors. This shower favors the Northern Hemisphere, but no matter where you live worldwide, the best viewing hours are usually in the wee hours just after midnight. The moon will be setting somewhere between midnight and dawn (and later and later each night this weekend). 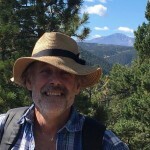 So … the shower is for intrepid observers only! On the other hand … even one bright meteor can be a treat, especially since a good percentage of the Taurid meteors tend to be fireballs! Click here for a custom sunrise/set calendar; be sure to click the box for moonrise/set times. Let’s hope a few Taurid fireballs can overcome the moonlight! One of 32 constellation cards in Urania’s Mirror (View of the Heavens), via ianridpath.com. The North Taurid meteors derive their name from the constellation Taurus the Bull. If you trace the paths of the Taurid meteors backward, you’ll see they appear to radiate from near the famous Pleiades star cluster of this constellation on the peak nights of the North Taurid meteor shower. 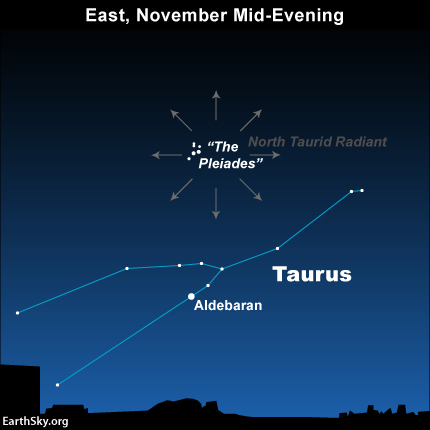 You don’t have to find Taurus, though, to watch the North Taurid meteors. These slow-moving meteors can light up any part of the starry heavens, streaking through a wide variety of constellations. So just lie back comfortably and gaze in all parts of the sky, while waiting for the Taurid meteors. Taurid meteor seen by Ken Christison in Conway, North Carolina on November 8, 2012. See the V-shaped face of the Bull in Taurus, and the very bright planet Jupiter nearby? On a moonless night, a dark sky highlights the Bull – the radiant point for the North Taurid meteors – in all his starlit majesty. Taurus contains many noticeable stars – plus two star clusters – and is pretty easy to spot. 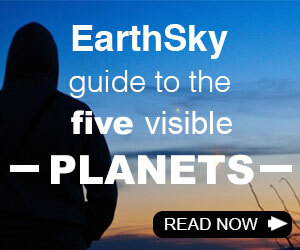 The Bull appears over the eastern horizon by around 8 p.m. and is highest up in the sky around 1 a.m. 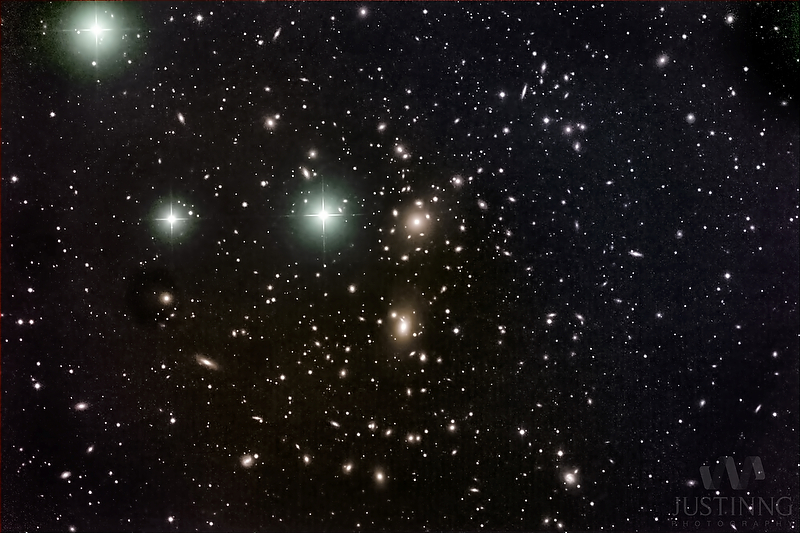 The Bull’s face consists of a V-shaped star cluster called the Hyades cluster. The Bull’s fiery red eye – the star Aldebaran – is not part of the Hyades. This ruddy star lies in the same direction, though at only about half the distance to the Hyades cluster. The star Elnath marks the tip of the Bull’s northern horn. And the Pleiades star cluster marks the Bull’s shoulder. 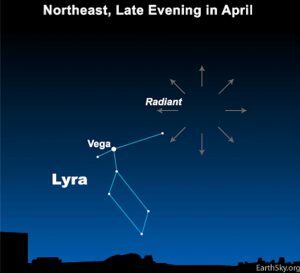 The radiant point of this shower soars to his highest point for the night around 12:30 a.m. local time. That’s why the meteors are best around then. 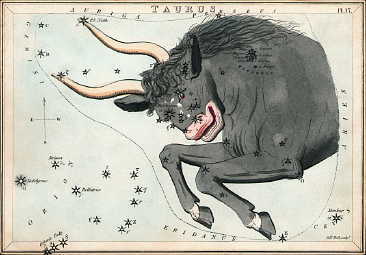 Taurus descends westward throughout the morning hours, and is found over the western horizon by daybreak. Meteor flies by constellation Orion. At top left of photo, planet Jupiter and star Aldebaran highlight constellation Taurus, near the radiant point of this weekend’s meteor shower. 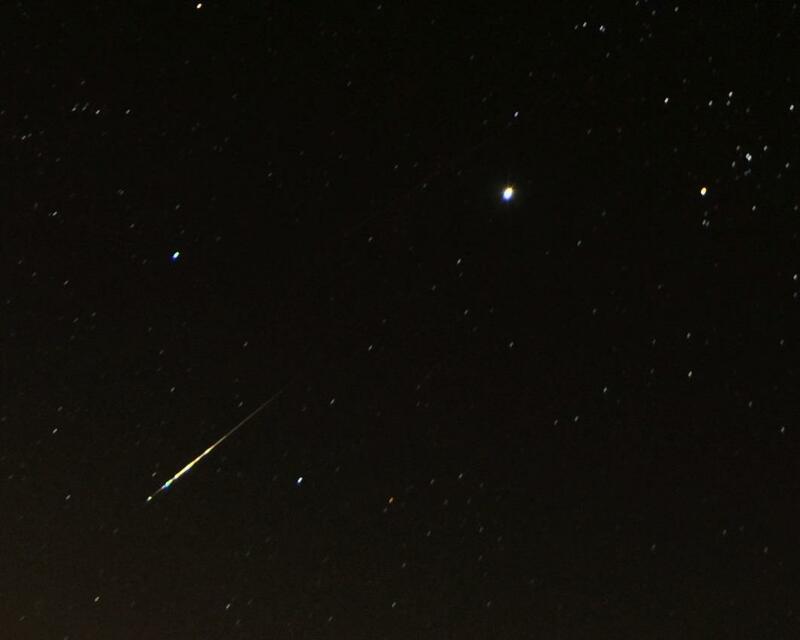 Allen Lefever captured this meteor in November 2012. Bottom line: The year 2019 finds the slow-moving North Taurid meteors having to compete with moonlight, as this shower reaches its peak on the night of November 11-12.